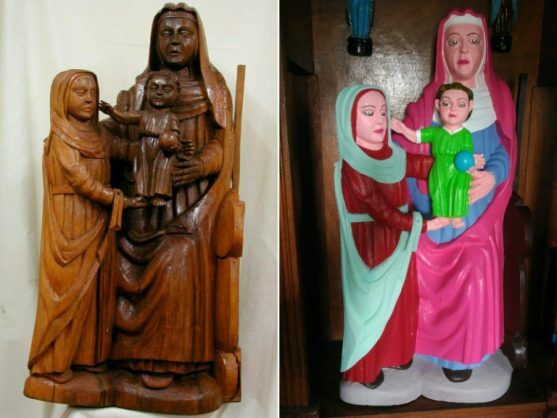 A Spanish parishioner has painted three 15th century sculptures in garish colours, giving baby Jesus a colourful new style. A wooden statue of the Virgin Mary at the chapel in El Ranadoiro, a hamlet in the northern Asturias region that is home to just 28 people, was given a bright pink headscarf, sky blue robe and eyeliner. The previously plain wooden carving also features a young Jesus in a bright green robe, while a third statue of Saint Peter now has him in blood red garments. The makeover has led to comparisons with the botched 2012 restoration by an elderly parishioner of the “Ecce Homo” fresco of Jesus Christ in Borja which resembled a pale-faced ape with cartoon-style eyes. “It’s crazy,” said Luis Suarez Saro, who had previously restored the three El Ranadoiro sculptures in 2002-2003 with the regional government’s approval. The woman who carried out the latest restoration, local resident Maria Luisa Menendez, received permission from the parish priest to give them a fresh lick of paint, local newspaper El Comercio reported. “I’m not a professional, but I always liked to do it, and the figures really needed to be painted. So I painted them as I could, with the colours that looked good to me, and the neighbours liked it,” she told the daily. While the paint job sparked hilarity online, Spanish art conservation association ACRE sounded the alarm. “Does no one care about this continued pillaging in our country? What kind of society stands by as its ancestor’s legacy is destroyed before its eyes,” it asked on Twitter. A church in the northern town of Estella came under fire in June for an amateur restoration of a 16th century wooden sculpture of Saint George which some Twitter users said made it look like comic-book character Tintin. The botched restoration of the “Ecce Homo” fresco has become famous meanwhile, with thousands of tourists now visiting Borja to see it. It also inspired a comic opera that was staged in the 16th-century Sanctuary of Our Lady of Mercy where the painting is encased on a wall.